Yuki (結城) is Edo Style town located in Ibaraki prefecture. There are many Edo style buildings remaining from Edo period and Meiji Period. Those buildings are called Misegura ( 見世蔵), shops and storage. Yuki was the castle town of Yuki clan. Temples of Yuki have also historical value. Shomyoji temple was built in Kamakura Period by the first Yuki, Yuki Tomomitsu. Gugyoji temples which built by Yuki Hideyasu, the son of Tokugawa Ieyasu, remains the original building which built in 1595. 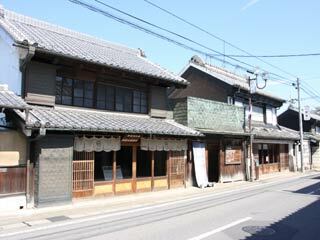 Yuki is also famous for its silk weaving, called Yuki Tsumugi. At Tsumugi no Yakata, there are demonstration of its weaving and coloring which you can also experience. ... is Edo Style building which made from wood and soil. It is a strong fireproof building, so many merchants built their store in this way. This style is also called Kurazukuri which commonly used for storage. Misegura is the same style of Kurazukuri, but the first floor is used as the store and the second floor was used for storage. Mulberry is the featured fruits in Yuki, and it's jelly is popular around this area. Yude Manju, boild rice cake with sweet beans, are also unique food in Yuki. It has very different taste compare to the ordinary Manju.